This is a beautifully presented, book with colorful watercolor style illustrations. It is a Level 2 reader so the language has been chosen carefully and simply so early readers can manage it. 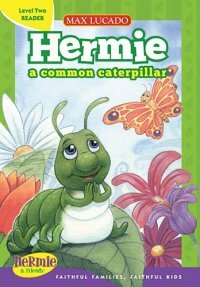 The story is very cute about Hermie the common caterpiller who was wondering why God didn't give him pretty patterns or spots or designs like other insects and God just told him He hasn't finished with him yet... Then as expected Hermie became a beautiful butterfly. I like the way God is so part of all the thought processes with Hermie having questions but still trusting God through it all. I like how the other insects acknowledge that they are beautiful but it is because how God made them. It's refreshing having stories like this for children so based in God teaching them to think of God in everything as that's really how it should be. I hope to get more of the series of these - these are great stories for early readers and the kind of stories that children will enjoy. I also like that it is a hardback meaning it will last a long time. I definitely recommend this book.